Bearing in mind the recent Crib Point tragedy - a suspected arson attack, with wildlife loss yet to be detailed, one home destroyed and one home damaged plus several sheds destroyed, we have to be more vigilant about how and whether we develop our bushland neighbourhoods more densely. Planning laws allow property owners to remove large amounts of vegetation without permission from their land citing their reason as 'fire protection'. After the vegetation is removed, those property owners may apply to the council for permission to intensify development on the land. Council usually does not deny permission for individual cases. But such individual cases mount up and create a danger which councils and planners may not have seen. The risk is that the granting of denser housing development in a bushland area means that, if there is a fire in the remaining bushland, there will be an increased number of residents needing to evacuate. Increasing population density means that more roads are needed to cope with a fire emergency evacuation. However, densification is being allowed to happen in an ad hoc, case by case fashion, without the building of roads in advance of significant development. No-one is overseeing the total impact. 477 Waterfall Gully Rd Rosebud 3939 Victoria. Clearing took place on Friday 15/1/16, Monday 18/1/16 and Tuesday 19/1/16 thus far. To date up to 45 trees and shrubs have been removed, including 4 manna gums. One which was a hollow bearing tree and one on a neighbouring property. Most of the other vegetation removed was coast tea-tree. I called the Mornington Peninsula shire council's planning department, on the 18th and 19th of January about the clearing of vegetation. The officers I spoke to on both days confirmed that there are no permits for either vegetation clearance or an application permit for a building extension/residential development. The planning department said that the vegetation clearance was legal without a permit. As the vegetation in question was within 10 meters to the residence or 4 meters within the property boundary. No 477 Waterfall Gully residence has been unoccupied since November, when it was sold. That the first action of the owner is to remove all trees and shrubs from site would suggest it is being cleared for a development - an opinion shared by the professionals clearing the vegetation and by the surrounding neighbours. Two of the three days the vegetation being cleared were days of total fire ban. The 18th and 19th of January were days of total fire bans. The use of multiple heavy industrial petrol operated equipment on days of total fire ban, I believe, makes a mockery of fire prevention laws. 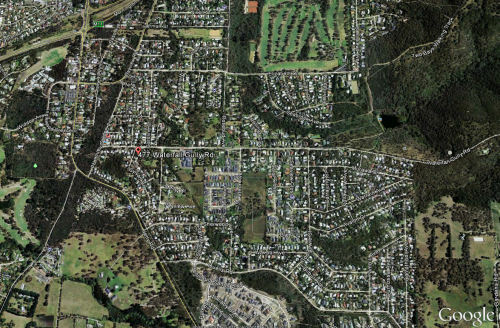 Close loop holes that developers use to clear vegetation under false pretences, which cost the Shire revenue. The character of a neighbourhood defines the people and families that live in an area. Many of these people who live in community make real value contributions to the neighbourhood character by volunteering their time. It is of great disappointment that potential developers ( who more often than not, do not live in the neighbourhood) use inequities in planning laws to change a neighbourhood character for financial gain. Waterfall Gully Rd/ South Rosebud is a bushy area and as such creates a certain atmosphere to the suburb. Residing in a beautiful neighbourhood therefore contributes to a mentally healthy state of its residents. The removal of trees for more dwellings creates a heat island. As our population ages heat stress related illnesses is becoming a more of an issue. Noise pollution from vegetation clearance and building is another factor of having a major impact on health and well being. Planning laws allow property owners to remove large amounts of vegetation without permission from their land citing their reason as 'fire protection'. After the vegetation is removed, those property owners may apply to the council for permission to intensify development on the land. Council usually does not deny permission for individual cases. But such individual cases mount up and create a danger which councils and planners may not have seen. The risk is that the granting of denser housing development in a bushland area means that, if there is a fire in the remaining bushland, there will be an increased number of residents needing to evacuate. Increasing population density means that more roads are needed to cope with a fire emergency evacuation. However, densification is being allowed to happen in an ad hoc, case by case fashion, without the building of roads in advance of significant development. No-one is overseeing the total impact. Most people who choose to live in bushland area would not approve of significant intensification of development. They would need to be alerted to any plans to build new roads for a planned increase in population and would probably object to significantly increased population plans. They are not being alerted, the roads are not being built, but the densification is happening in an unplanned fashion. This is dangerous. If a fire emergency was to threaten South Rosebud, Jetty Rd is the main route to escape! Even though wildlife are protected, there never seems to be any enforcement to protect them. Up to 45 trees and shrubs were cleared at 477 Waterfall Gully Rd. What happens to those animals who have now lost their home?